Medical Ethics, Law and Communication at a Glance presents a succinct overview of these key areas of the medical curriculum. This new title aims to provide a concise summary of the three core, interlinked topics essential to resolving ethical dilemmas in medicine and avoiding medico-legal action. Divided into two sections; the first examines the ethical and legal principles underpinning each medical topic; while the second focuses on communication skills and the importance of good communication. 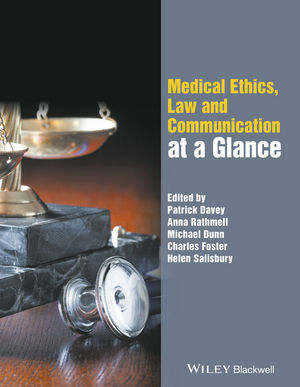 Medical Ethics, Law and Communication at a Glance offers an accessible introduction to the fundamentals of good medical practice, and will provide indispensable support for undergraduate medical students and nurses, as well as newly qualified healthcare professionals. Patrick Davey, consultant cardiologist, has extensive experience in publishing, having edited the best selling 'Medicine at a Glance', as well as 'ECG at a Glance', and is currently editing a major new textbook for Oxford University Press on diagnosis and treatment in internal medicine. Anna Rathmell works in the pharmaceutical industry, has recently completed an MA in medical law and ethics at Manchester University. She teaches on the undergraduate course in medical ethics and law at Oxford University. She has contributed chapters on medical ethics to 'Medicine at a Glance'.